Planit Crowd is your cost-efficient final quality gate. Test when you need to, and go-live with confidence. Leverage vetted and fully certified professional testers who know how to find defects faster and report them properly. Access a world-first platform built on Salesforce Communities that provides live updates of defects as they are found. We're with you at every step. From scoping to final reports, every engagement has a dedicated Planit Crowd Lead. A website or application that is unintuitive, slow, crashes or has errors can adversely impact your business reputation and result in sending customers to your competitors. Safeguard your business by engaging the Planit Crowd of certified QA professionals to provide user-centric testing. When you choose the Planit Crowd you're accessing a network of 1,000+ experienced testers who are 100% certified and can put your app or website to the test in real-world scenarios, identifying issues that may affect your users and providing high quality documentation of their findings. For many providers, their crowd can lack the skills to adequately verify the quality of what they’re testing. At Planit, our vetted crowd is fully comprised of certified testing professionals. Achieve better test coverage, uncover more critical issues and receive expertly documented defects. Why pay extra for test management? Planit includes planning and support by a dedicated test manager free of charge. Your test manager will guide you through the process, verify and consolidate defects, and support your needs through open and clear communication. Don’t sit around waiting for your testing results to be published! Get full visibility and real-time results via our world-first crowd portal built on the Salesforce Community Cloud. Access meaningful high-level reporting or deep dive into the defects and start resolving them right away. Even as a first-time user, the Planit Crowd is quick and easy to engage. We will help you choose the right Crowd for your needs based on headcount and time to deliver. We'll activate your Crowd and provide you with access to our self-service crowd portal. 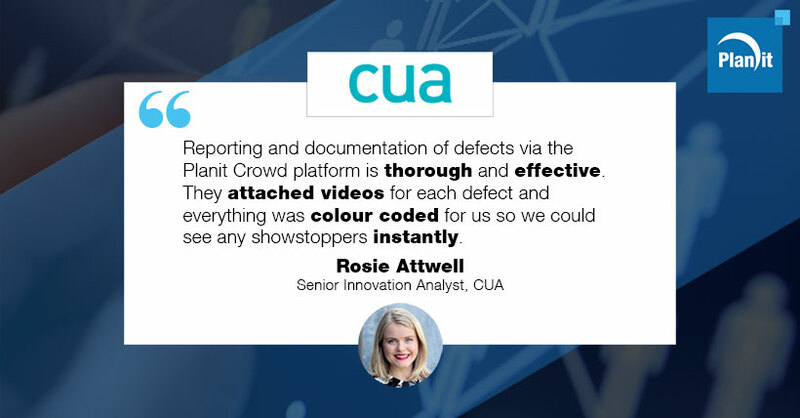 Available on-demand and quick to engage, the Planit Crowd is a cost-efficient final quality gate empowering you to go-live with confidence. Following your enquiry, we will promptly assess your needs and goals. With this information in hand, we will propose a crowd test plan including the required skills and deliverables as well as a fixed price quote for execution. Upon acceptance, we define test cases and configurations for the project, recruit the appropriate testers and establish the test environment. Execution will then commence under the supervision of your dedicated crowd manager. Your dedicated crowd manager will validate and consolidate the test results and provide easy-to-action reporting. We will present these results to you, rate our crowdtesters and close the test cycle. We can discuss further test cycles if required by the client. Planit has partnered with Salesforce to create a powerful world-first crowd platform built on Salesforce Communities. Access real-time information on your project. Track progress and gain the transparency you need to quickly action fixes. Yes, I would like to receive information from Planit including our eNewsletter.